As part of the Copernicus Atmosphere Monitoring Service (CAMS), I lead an activity that will provide in August new estimates of radiative forcing of climate due to changes in atmospheric composition. One of the radiative forcing mechanisms that we are working to quantify is the interaction between aerosols and clouds. Aerosols are the small liquid and solid particles in suspension in the atmosphere. Human activities emit aerosols in the atmosphere, adding to natural levels and causing the formation of liquid clouds with droplets that are more numerous and smaller than in unpolluted clouds. A cloud made of more numerous droplets is brighter, reflecting more radiation back to space. A cloud made of smaller droplets may evaporate more easily, becoming thinner or even disappearing completely. Alternatively, smaller droplets may take longer to form rain, causing the cloud to linger in the atmosphere and reflect sunlight for longer. The physics of aerosol-cloud interactions are complex and have been the subject of many scientific studies, summarised in the latest assessment report of the Intergovernmental Panel on Climate Change. Radiative forcing is a measure of the imbalance in the Earth’s energy budget caused by perturbations external to the natural climate system, such as the emission of aerosols into the atmosphere by human activities. Our preliminary CAMS estimate of radiative forcing due to aerosol-cloud interactions, based on satellite observations of aerosol amounts and cloud reflectivity, is –0.6 W m−2. The negative sign indicates a loss of energy for the climate system. The estimate of climate models for the same radiative forcing is stronger, typically larger than –1 W m−2. What causes that discrepancy? Over the past few months, I have discussed with experts in aerosol-cloud interactions, and there are reasons to expect that aerosol-cloud interactions are weaker than simulated by climate models – and perhaps even weaker than the preliminary CAMS estimate. The modification of cloud properties by external perturbations is observed routinely. 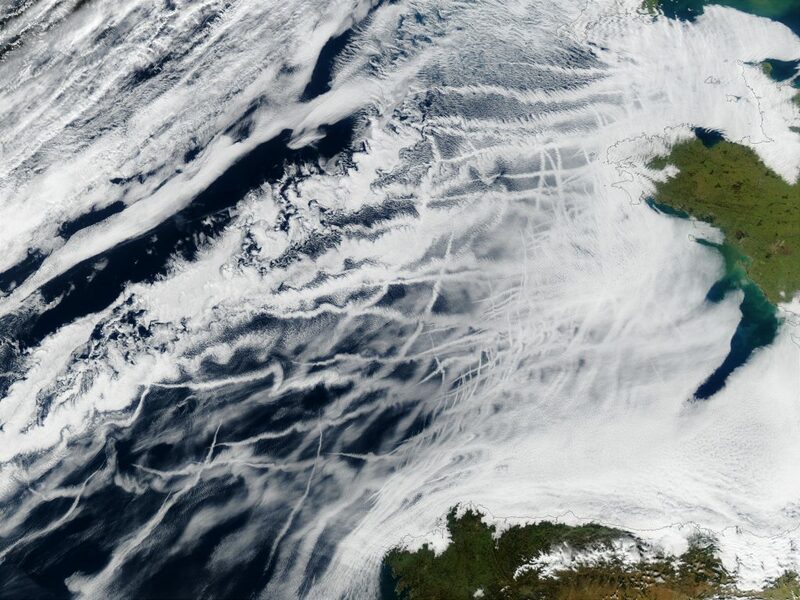 Ship tracks are emblematic examples: the aerosols emitted by ship engines provide additional sites for water vapour to condensate into cloud droplets, forming linear clouds along the ship’s route. If a single ship can create new clouds, surely the masses of aerosols emitted worldwide by transport and power generation must exert a strong radiative forcing. But crucially, ship tracks do not happen all the time, otherwise the busy shipping lanes linking Europe, Asia, and North America would leave a noticeable and persistent trail of clouds on satellite pictures (Figure 1). This is not the case. Figure 1. Ship tracks off the Atlantic coasts of France and Spain, as observed by NASA’s MODIS satellite instrument in January 2003. Another event casts doubts on the possibility of strong radiative forcing from aerosol-cloud interactions. In late 2014/early 2015, the Holuhraun volcano erupted in Iceland. This eruption injected masses of aerosols into the atmosphere – so many aerosols in fact that at one point the volcano emitted as much in a day than the entire European Union combined. Such a large and precisely located perturbation was the perfect laboratory for studying aerosol-cloud interactions. And indeed, satellite instruments reported that clouds in the North Atlantic were composed of smaller droplets than normal, as expected from the physics of aerosol-cloud interactions. But were North Atlantic clouds brighter than normal during that period? Observations are inconclusive. It may be that aerosol-cloud interactions are lost in the noise of natural variability in cloud properties, but for such a large perturbation, the impacts are surprisingly hard to isolate. In the end, aerosol-cloud scientists reckon that it will come down to counting how often clouds happen to show strong sensitivity to aerosol perturbations. Those discussions leave me with the feeling that such situations occur infrequently, and radiative forcing of aerosol-cloud interactions may need to be revised down to weaker values. I thank Graham Feingold, Johannes Quaas, Annica Ekman, Leo Donner, and Ilan Koren for interesting discussions on current understanding of aerosol-cloud interactions. Note that they do not all agree that aerosol-cloud radiative forcing is weak: some argue that a value of up to −1.2 W m−2 remains consistent with scientific understanding. This entry was posted in Aerosols, Climate modelling, Numerical modelling. Bookmark the permalink.